paul2590 and Dicky5ash like this. Thanks..Do you also recommend a filterking for a stock 1600 twin port? It makes absolutely no sense to have the cutoff between the pump and the carb. What would you be trying to achieve? Needs to go between the tank and the engine compartment, to stop fuel hosing out of the tank by gravity if a fuel line ruptures. Mark Darby, Vancam70, Valveandy and 4 others like this. I’ve just fitted one to ours this week. Bolted to the sloppy bit of the cargo floor between the wheel arches. VW-Pete and snotty like this. It’s Pizza Express’s crappy wifi! 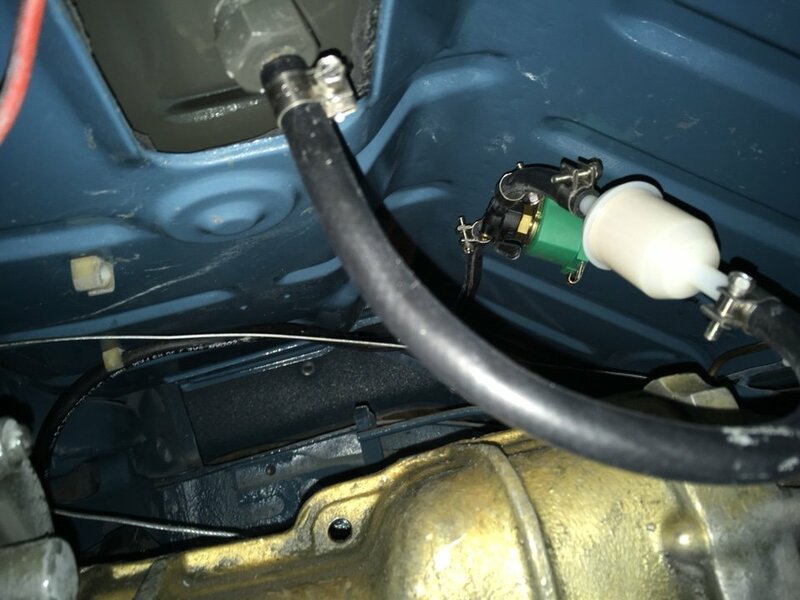 The problem I was buying the solenoid for was fuel flowing when the engine was off...eg float in the carb sticks...surely if a ruptured pipe was gonna go..it would go when the engine’s running and there’s pressure on the pipes rather than standing..or am I missing something? Cutoff after the tank means that if your engine for some reason catches fire, the tank doesn't gravity-feed 50 litres of fuel into the engine compartment to get a nice (uncontrollable) blaze going. Turn the ignition off, and the flow of fuel stops. Even with an EMPI carb, the float valve shouldn't keep sticking. Even the valves in the repair kits are more or less ok. How do you know it sticks?